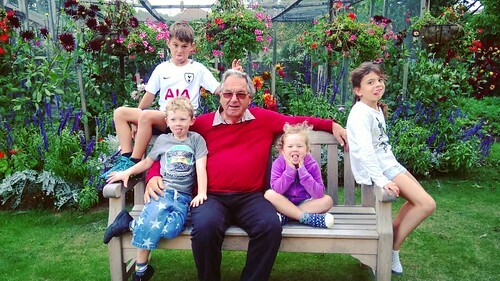 Every week my Dad comes for tea and the children love seeing him. We were especially happy to see him today as he looked after them whilst The Mister and I went out. 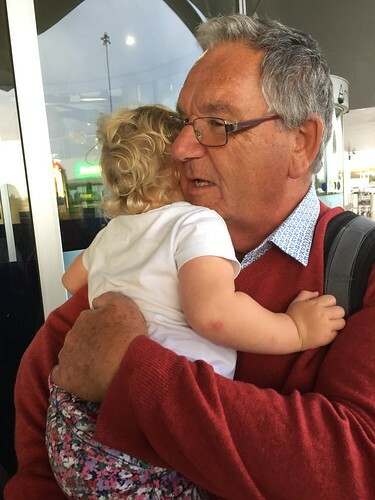 On Saturday The Little Miss and I went to pick my Dad up from the airport. 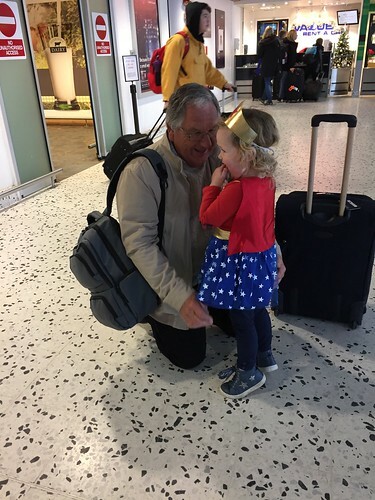 It was very funny to see Wonder Woman ‘flying’ across the airport concourse to meet her beloved Grandpa. 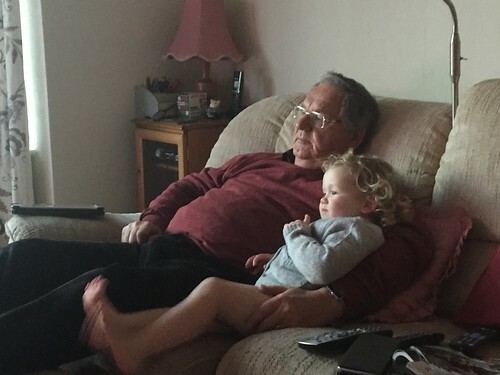 Grandpa came for lunch and we ate pudding in the lounge whilst watching The Grand Prix. The Little Miss has decided her usual seats aren’t quite the right height for her – she would rather sit on puzzle boxes. 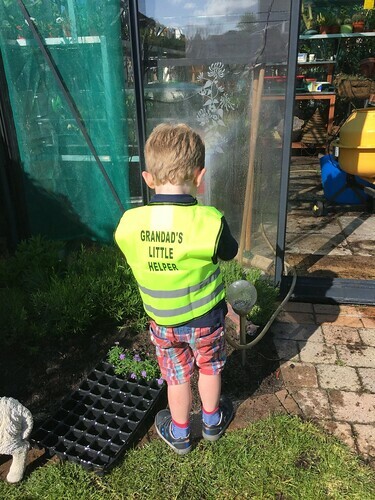 It would appear that Grandpa has some staff to help out in his garden. He loves a high-vis jacket for his employees. A quick photo from yesterday. 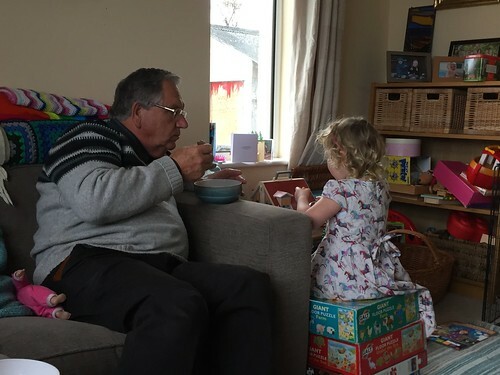 The Little Miss absolutely adores her Grandpa and she asks about him all the time, gets cross with me when I don’t let her speak to him on the phone and insists on sitting next to him when he is here for tea. We popped to Dad’s house to put some washing in (it’s a bad week for the washing machine to be futu, just when we are starting potty training) and Dad was watching the football. The Little Miss happily snuggled up with him for a few minutes and it made me smile. 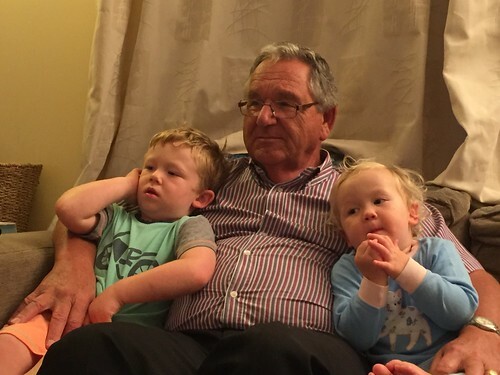 This is how Grandpa does babysitting. Not a ladder or rusty saw in sight this time though. 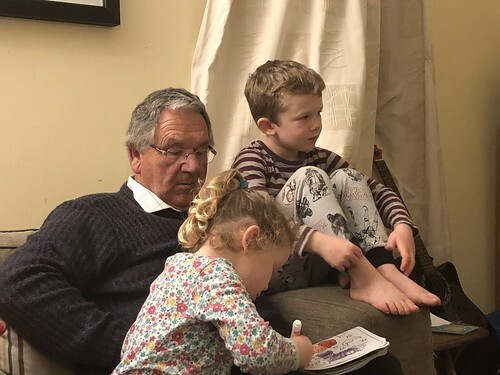 Dad came for tea and I love seeing him snuggled up with the children. 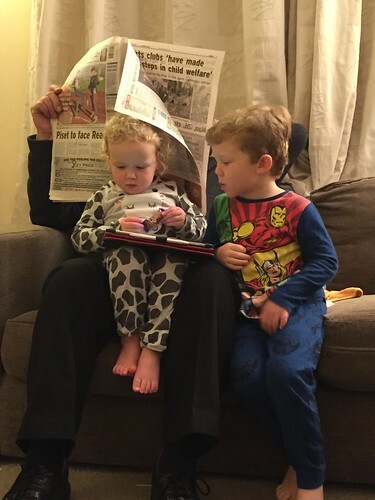 They love him such a lot, and not just for his iPad! It has been a long journey to get here, both in terms of our emotional progress but also in terms of travelling time! Today we left the hotel at 5am UK time and arrived back at about 6pm. Feeling shattered after an emotional weekend but time well spent together. As Mum said so eloquently ‘it’s good to have time’. We arrived at Guernsey airport and The Mister and the kids were there to greet us. 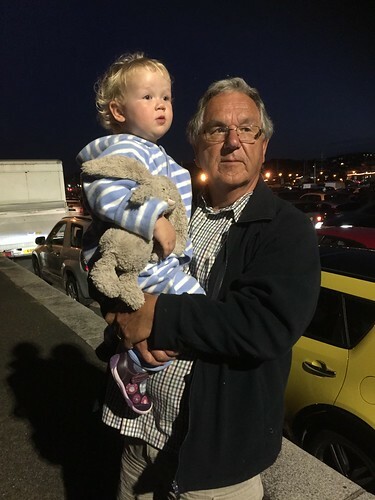 The Little Mister ran straight to me for a cuddle whilst The Little Miss ran across the concourse shouting ‘Mummyyyyyyy’ until she saw Grandpa walking next to me and she swerved to run to him first for a cuddle. She’s not daft. It always pays to keep Grandpa sweet! This week is Battle of Britain Week and on Thursday there in the Guernsey Air Display. This evening the Aerosparx team gave a display over the seafront. Two powered gliders, illuminated with LED lights and fireworks. It was very good but too short! We got the kids bathed and ready for bed and then popped them in a onesie each and went out. They had a lovely time although it was a late night for them!